This Stuffed Hippo Toy is great for stocking stuffer, Easter basket, surprise travel toy, grab bag, prize, etc. A plastic clip is attached to its head. You could clip it on your purse, backpack, or bag, etc. 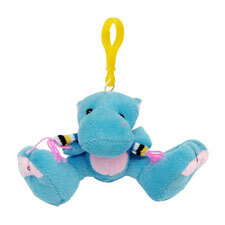 Cute Stuffed Hippo Toy has a clip so you can take it with you wherever you go. It is made of soft fabric with a beautiful scarf around its neck. This Clip Stuffed Toy is great for your backpack, bag, belt loop, luggage, handbag, lunch box, jacket, briefcases, or just about anywhere. It is also great for stocking stuffer or decorating. Just the right size for cuddling, collecting and easy display! Mini Hippo Toy in excellent condition with no tears or stains.